The barter system: An old business makes a comeback COLUMBIA, SC (WIS) – It may seem like a blast from the past, but an old system of getting what you want is back. 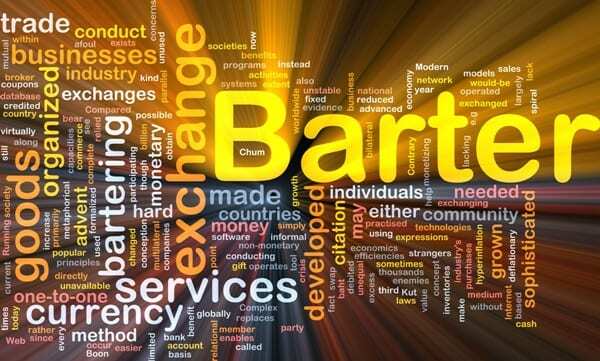 Bartering is a way of exchanging things instead of cash that’s growing in popularity — again. The first kind of business was the barter system. A good stonecutter might make a few extra tools and simply trade them for furs or other things he wanted. It’s so simple the cavemen did it. Today bartering is back, but it’s a little more advanced. “It’s one of the best things I’ve done for my business,” says Sharon May, who owns Hennessy’s restaurant in Columbia. She’s been bartering for years. “You’re not limited to bartering between just you and me. It’s a whole group,” says May. A group that’s growing, as small business are having trouble keeping up their cashflows. May does her trading with The Barter Company, one of many groups that brings traders together. “It’s an alternative form of currency,” says Barter Company spokesman Randy Wolfe. Wolfe says for a fee, small businesses are added to a database stretching across the southeast. They can put anything up for a cashless trade. At Hennessy’s, May can trade gift certificates and vacant tables for what the company calls barter dollars. She then uses those barter bucks at member businesses for things like carpet cleaning or a new awning, all cash-free. “I use to own a business, I’ve experienced both sides of this, there’s no downside to barter,” says Wolfe. Wolfe calls bartering the best way to move excess inventory without having to discount. “We bring you new business, you spend less cash. It uses up your excess inventory you bring in new cash business through members referring you. It’s win-win-win-win. In this economy that’s why we’re growing so fast,” he says. It might be a little dated, but when the times get tough old tricks might be the best tricks. Reported by Taylor Kearns.